Congratulations to Véronique Boulocher-Passet for another successful AFM/CCMP Case Writing Competition. Véronique Boulocher-Passet is a Marketing lecturer on our MBA and Masters courses. In 2016, Véronique’s case study “Wikicells” was awarded Best Educational Case Study by the Association Française de Marketing (AFM) and Centrale des Cases et Medias Pedagogiques (CCMP). 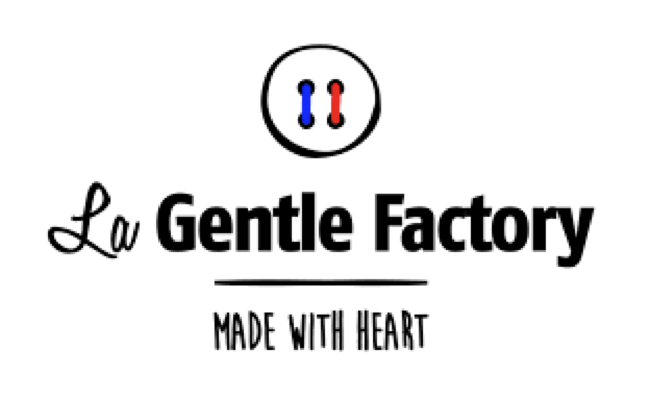 Following on from last year’s success Véronique, with two co-authors, submitted another case study for the 2017 AFM/CCMP Prize for Best Educational Case Study in Marketing – “La Gentle Factory”. Detailing the newly created brand of sustainable men fashion, students are placed in the shoes of the newly appointed brand manager to help finding the best growth strategy for the brand. “La Gentle Factory” was selected among finalists and came second Best Educational Case in Marketing 2017. Véronique is using this case study within the core module, Marketing Planning and Strategy, for this year’s MSc Marketing programme. Véronique talks us through her winning case study: “Packaging you can eat, WikiCell: a qualitative study before launching a revolutionary packaging”. Case studies play a prominent role among teaching tools because they illustrate theories and help the appropriation of marketing concepts. In order to recognise the quality of the cases produced by its members, in collaboration with the CCMP (Centrale des Cases et Médias Pédagogiques), AFM (Association Française de Marketing) organised the 1st AFM-CCMP Prize for Best Educational Case in Marketing in 2012 and has been running the Prize since. This award is intended to annually recognise the analysis of original and innovative marketing case studies. Each case is evaluated by at least two reviewers according to a grid which includes specific criteria. For the 2016 edition, 22 cases were submitted (Air France and crisis communication, Meetic and the launch of a new offer, Michel and Augustin and consumer behavior, etc.) and the three finalists presented their work at a special session devoted to cases during the Lyon congress. 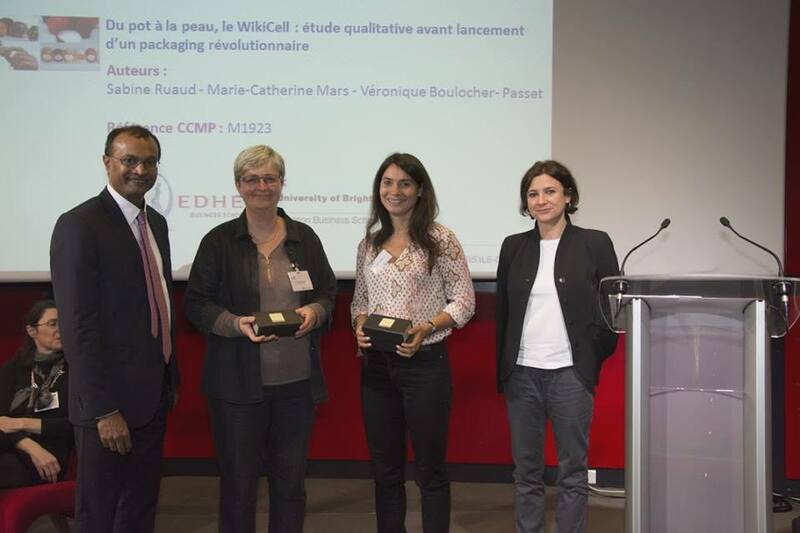 The award-winning case, “Packaging you can eat, WikiCell: a qualitative study before launching a revolutionary packaging”, was proposed by Véronique Boulocher-Passet (University of Brighton’s Business School), Sabine Ruaud (Edhec Business School), and Marie-Catherine Mars (Edhec Business School). From left to right: Raphaël Gnanou, Head Manager of CCMP, Véronique Boulocher-Passet (University of Brighton’s Business School), Sabine Ruaud (Edhec Business School), receiving their award for Wikicells. The winning case study places students in the shoes of Antoine Mahy, Head of WikiFoods, who wants to develop a novel concept on the French market, after a successful launch in the US. Presenting a step-by-step implementation of a qualitative study guiding the development of a new packaging, the case study allows students to better understand how to conduct qualitative studies in marketing as well as their role in launching a new product offer. The pioneers of this technology are David Edwards, an American Harvard Professor and concept creator; François Azambourg, a talented French food designer; and Antoine Mahy, a former Category Director in a large soft drinks company. 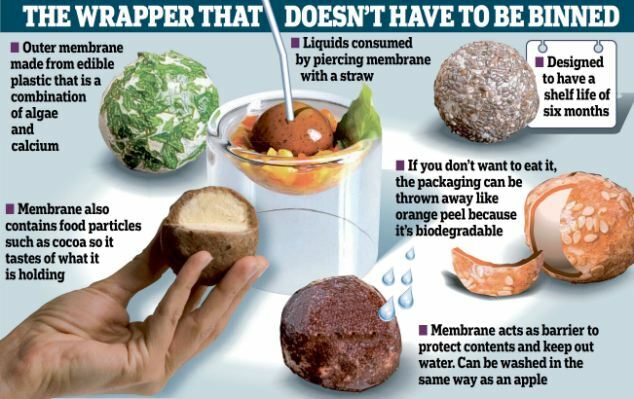 They developed the packaging of the future way back in 2009, namely an edible packaging for all foods, inspired by natural properties whereby vegetables (tomatoes, etc.) and fruits (apricots, nectarines, apples, grapes, etc.) are ‘packaged’ (i.e. with either a peel or with an outer layer of protection) to coat food and drink via the invention of a waterproof membrane made from natural components that can be enhanced with nutrients and fragrances to create unprecedented taste associations. In 2014, after four years of hard work, the three partners had launched WikiPearls in the US, and test marketed the product in four Whole Food Markets in Massachusetts, in partnership with Stonyfield, a US subsidiary of Danone specialised in yoghurts and organic milk products. In one year, WikiPearls had inspired others to adopt the product: they were now distributed in 40 Whole Food Markets located between Boston and Philadelphia. Could this success be replicated in France? 42 in-depth interviews with potential customers were conducted to understand major motivations and obstacles to purchasing food packaged in a Wikicell. Students will have to debate on the choice of a qualitative method for this study, will be able to critically analyse the choice of interview guide that was made, and will finally analyse the collected data in order to make recommendations to Antoine on launching Wikicells in France. Tagged awards, Competition, Industry, Marketing. Bookmark the permalink.